As earlier promised, our memo this week will focus on the accomplishments of our first republican president for the Zambian Enterprise as he celebrates his birthday anniversary. We understand that most Africans get their understanding of historical records based on the west and understandably so; because a large part of our history on the entire continent has been written for us by western scholars. What we have found over the years is that such writings are usually biased, in most cases not fully factual and at best mostly incomplete. They tend to serve the egos of the writer more than the premise of shared knowledge. We at the Chronicle will endeavor to rewrite our own history in most instances and what a better time to start than during commemorative events such as a birthday of one of the greatest sons of Africa. He was born at Lubwa Mission near Chinsali in Northern Province on April 24, 1924 to missionary parents from Malawi. His parents moved to Zambia in 1904 as ordained minister and teacher. In fact his mother was the first African woman to teach in colonial Zambia. He was the youngest of eight siblings but grew up with determination and self respect of the older child. At an earlier age, Kenneth was seen by his peers as a natural born leader who for the most part had the ability to unity factions. He was barely 19 when he began teaching at Lubwa after completing his education and by the time he was 20 years old, he was Headmaster there. He remained at Lubwa from 1944 to 1947 when he moved to the Copperbelt to found a farmer’s cooperative union in 1948. While working on his cooperative venture he also worked as a boarding master at Mufulira Upper School (1948 – 1949) which period provided him with first hand discriminatory tendencies of white supremacy and its evil conniptions at the time. His teaching job, cooperative venture and his welfare officer status accorded him the ability to see and understand the real sufferings of his country men and women and thus he decided to join forces with the African National Congress. What most Africans don’t know is that the ANC was similar to a continental liberation movement not only in South Africa but almost across the whole Sub-Saharan region. It was a Black Movement that transcended regional and national borders at the time. District and provincial centers were organized at various locales and so to be effective Kaunda thought he needed to be in a place where most people were familiar with his passion and norms. He thus left the Copperbelt and went back to the Northern Province where he quickly rose through the ranks. Harry Mwaanga Nkumbula was the national president for the Zambian Chapter of ANC and he immediately noticed Kaunda accolades. Kenneth D Kaunda was asked to move to Lusaka in 1953 as Secretary General under the Nkumbula presidency. In 1957 Kaunda traveled to India and met Mohandas Gandhi and was forever deeply influenced by the nonviolent civil disobedience principles he had devised and saw them as a way of leading the liberation struggle in his own nation. Upon returning home, he shared both his passion and principles he had learnt from Gandhi with his boss (Nkumbula) but the later was seen more as an appeaser of whites more than a freedom fighter. It is believed that Nkumbula’s attitude emanated from a series of prison stints he was forced to survive with Kaunda during the time he became Secretary General. They were frequently in and out of prison for brief periods between 1953 and 1958. The fire in Kaunda’s belly was too much and his boss’ reluctance was not helping, so he broke camps with Nkumbula to form his new party called Zambia African National Union in 1958 a year after trying to get Nkumbula and company on board with the nonviolent movement. To the contrary nor sooner had Kaunda formed his Zambia African National Union in 1958 than he had actually abandoned his nonviolent rule. Between 1958 and 1959 his party was at the center of the famous Cha Cha Cha movement which included burning schools, blocking roads, work walk outs and other arm twisting programs aimed at the white supremacists. His party was banned and he was sentenced to prison for nine months. He served part of the sentence in Lusaka and the remainder was in Salisbury, present day Harare. It is believed that the Harare stint was designed to break Kaunda’s ego but instead it emboldened him. While he was in prison Mainza Chona also left ANC to form the United National Independence Party (UNIP) in 1959 and when he (Kaunda) was released was immediately asked by him to be its president. Kaunda obliged, stood for legislative council elections and on October 30, 1962 he won, formed a coalition government with Nkumbula’s ANC serving as minister of local government and social welfare. In government Kaunda rose to the rank of Prime Minister and used his diplomatic skills convincing and allaying huge European and Asian fears that black rule would not be detrimental to their welfare after all. After wining their confidence, the Zambian Enterprise went through a series of complicated phases that finally earned us our independence on October 24, 1964 with the Kenneth D Kaunda as the First Republican President and Nkumbula as his vice. They say every politician develops a high level of shrewdness in order to survive and Kaunda was no different. His diplomatic skills did not only lead to independence, they also contributed to his ability to unite a nation of 72 tribes into one solid nation under the Tiyende Pamodzi mantra. Tiyende Pamodzi was more than a unity phrase, it was also an inspirational diatribe that encouraged every Zambian to work hard as well as show a high level of discipline. The “One Zambia One Nation” mantra made every Zambian feel a sense of belonging thus saving the country from any traumas of civil war. By bestowing a sense of Christian socialism, properly packaged as Zambian Humanism, Kaunda skillfully managed to stem off all manner of tribalism and developed a sense of good neighborhoodness thus developing a closely neat society with the ability to notice dissensions from within as well as without. However, his major test wasn’t until the Lenshina Uprising. A self-styled prophetess, Alice Lenshina of the Lumpa religious sect was a major force to reckon with. Kaunda banned the religion and Lenshina was expelled into Zaire, present day DRC. The Lenshina Uprising was controversial in that former colonial matters were alleged to have been major sponsors, discouraging nationals from taking part in government programs thus instilling a rebellious notion of anti-nationalism that could have led to slow national development as well as ensuring of anarchy. Conflicts arose between UNIP youth and Lumpa members, especially in Chinsali District, where the headquarters of the church were. Kaunda sent in two battalions of the Northern Rhodesia Regiment. The fight led to the deaths of about 1500 villagers. Kaunda banned the Lumpa Church in August 1964 and proclaimed a state of emergency that was retained until 1991. 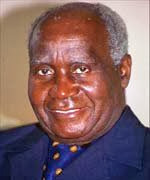 Kaunda also faced opposition at home, from such sources as Simon Kapwepwe's United Progressive Party (UPP) and the followers of nationalist Harry Nkumbula. Beginning in 1968, Kaunda took steps to undermine his opponents' power, for instance banning the UPP on charges of subversion. In some cases, powerful dissidents were offered positions within the UNIP hierarchy. By the end of 1972, Kaunda had effectively established the UNIP as Zambia's only legal political party under the Choma Declaration led by Mainza Chona. His hardball political shenanigans include his ability to use political power to consolidate his rule using the one-party participatory democracy theory. It is believed that it was this theory that led to a series of failed coupe d’état attempts the final culminating into the famous Mwamba Luchembe. Every general election or by-election, we bashed heads across the political divide, and unfortunately we had bodies to bury because of political differences, until ... I reached a decision that we must come together and stop this nonsense. Fortunately, we came together and from that time on, it has always been peace. Every election, there is peace." One of the greatest achievements of Dr. Kaunda was in the area of education. At independence it was estimated that only 0.5% of the entire population had completed primary education as our educational system was one of the most poorly developed in the entire British Commonwealth. Zambia had to invest heavily in education at all levels. Kaunda instituted a policy where all children, irrespective of their parents' ability to pay, were given free exercise books, pens and pencils. The parents' main responsibility was to buy uniforms, pay a token "school fee" and ensure that the children attended school. Infra-structural development in this area involved building government primary and secondary schools, in every district however rural. This approach meant that the best pupils were promoted to achieve their best results, all the way from primary school to university level. To compensate for the short in skilled teaching professionals, the government paid a premium and hired expatriate teachers and professors from all over the world of different nationalists as the nation was in a hurry to develop its own human capacity. The Zambian Enterprise had no university of its own at independence and within three years, the University of Zambia was opened in Lusaka in 1966. This was after Zambians all over the country had been encouraged to donate whatever they could afford towards its construction. Kaunda was appointed Chancellor and officiated at the first graduation ceremony in 1969. The main campus was situated on the Great East Road, while the medical campus was located at Ridgeway near the University Teaching Hospital. In 1979 another campus was established at the Zambia Institute of Technology in Kitwe. In 1988 the Kitwe campus was upgraded and renamed the Copperbelt University. Tertiary-level institutions were also established during Kaunda's era and were vocationally focused falling under the aegis of the Department of Technical Education and Vocational Training. They included the Evelyn Hone College of Applied Arts and Commerce and the Natural Resources Development College (both in Lusaka), the Northern Technical College at Ndola, Trades Training Institute in every major provincial capital, and teacher-training colleges. One the other hand the ministry of education was tasked with a duty of acquiring scholarships for other deserving student in the USA, the UK, Germany, India, China, Yugoslavia, Russia and others. This translated to having a country that only had 109 graduates at independence to one of the most literate on the entire continent by 1991 when he relinquished power. Zambia is one of the most urbanized Sub-Saharan countries. This is not by any means an accident, it was by design. The National Development Planning Division at Cabinet office was one of the most successful on the entire continent. It was so successful that Lusaka’s Cairo Road which was a dirt road at independence was turned into an hive of activities by 1991 with high rise building on every side. This was part of the Mulungushi reform of April 1968, a Zambian Marshall Plan if you like. The government declared its intention to acquire an equity holding (usually 51% or more) in a number of key foreign-owned firms, to be controlled by the Industrial Development Corporation (INDECO). By January 1970, Zambia had acquired majority holding in the Zambian operations of the two major foreign mining corporations, the Anglo American Corporation and the Rhodesia Selection Trust (RST); the two became the Nchanga Consolidated Copper Mines (NCCM) and Roan Consolidated Mines (RCM), respectively. Kaunda announced the creation of a new parastatal body, the Mining Development Corporation (MINDECO). The Finance and Development Corporation (FINDECO) allowed the Zambian government to gain control of insurance companies and building societies. The foreign-owned banks, such as Barclays, Standard Chartered and Grindlays, successfully resisted takeover. When this happened, ZANACO was born and the bank grew to be one of the most successful banking stories emanating from Africa in the entire world. It had branches across the nation as wells a fully functional London branch with satellite or correspondent branches across Europe. In 1971, INDECO, MINDECO, and FINDECO were brought together under an omnibus parastatal, the Zambia Industrial and Mining Corporation (ZIMCO), to create one of the largest companies in sub-Saharan Africa, with Kaunda as Chairman of the Board. The management contracts under which day-to-day operations of the mines had been carried out by Anglo American and RST were ended in 1973. In 1982 NCCM and RCM were merged into the giant Zambia Consolidated Copper Mines Ltd (ZCCM). ZCCM became the world’s largest conglomerate trading shares with a dual listing at the London Stock Exchange and the New York Stock Exchange as late as 1996. The domino effect of these programs led to each of these, INDECO, MINDECO, FINDECO and ZIMCO welding a lot of financial resources that were used to build business houses headquartered along Cairo Road thus accelerating development in Lusaka at exponential rates. Other developmental programs involved the building of Mwembeshi Earth Station, commissioned in 1974 just ten years after independence is still one of the few in the world. The sad story is that even up to now it is underutilized as a gateway. The Mukuku Bridge at the time of commissioning was Africa’s longest bridge while the Tazara Railway line broke world construction records. The development of Africa’s longest pipeline at the time connecting Dar-es-Salaam and Indeni in Ndola was another major accomplishment not experienced before on the continent. History will no doubt be kinder to Kaunda than current events might suggest. His individual bravery and leadership helped to establish Zambia as a nation during the twilight of colonial rule, and his international statesmanship has led to reforms even in the last bastion of minority rule, South Africa. It is no wonder that the first country Nelson Mandela visited after leaving prison in 1990 was Zambia and was an honored guest of Dr. Kenneth David Kaunda. That’s this week’s memo from us at the Zambian Chronicle … thanks a trillion.